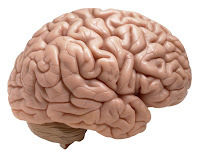 Interesting Facts About Brain | Do You Know? 6. There are no pain receptors in the brain, so the brain can feel no pain itself. 7. The human brain is the fattest organ in the body and may consists of at least 60% fat. 8. Humans continue to make new neurons throughout life in response to mental activity. 9. Alcohol interferes with brain processes by weakening connections between neurons. 10. Reading aloud and talking often to a young child promotes brain development. 11. The capacity for such emotions as joy, happiness, fear, and shyness are already developed at birth. The specific type of nurturing a child receives shapes how these emotions are developed. 12. The left side of your brain controls the right side of your body; and, the right side of your brain controls the left side of your body. 13. Every time you recall a memory or have a new thought, you are creating a new connection in your brain. 14. Memories triggered by scent have a stronger emotional connection, therefore appear more intense than other memory triggers. 16. Laughing at a joke is no simple task as it requires activity in five different areas of the brain. 17. Differences in brain weight and size do not equal differences in mental ability. The weight of Albert Einstein’s brain was 1,230 grams that is less than an average weight of the human brain. 18. A living brain is so soft you could cut it with a table knife. 19. There are about 100,000 miles of blood vessels in the brain. 20. The brain can live for 4 to 6 minutes without oxygen, and then it begins to die. No oxygen for 5 to 10 minutes will result in permanent brain damage.